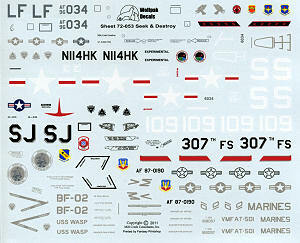 This next sheet from Wolfpak Decals has another fine collection of subjects, this time being mostly very modern subjects. This sheet contains markings for six subjects. The initial offering is an F-16D block 52 from the 425 FS at Luke AFB. The 425th is one of those units that comes and goes depending on need. Its primary purpose is training foreign pilots, this time for the Singapore AF. In the past they were equipped with F-5E/F to train those nations equipped with the type. What makes this incarnation of the unit a bit different is that it used aircraft owned by the trainee nation, so while decked out in USAF markings, it is not a USAF owned aircraft. I had the pleasure of photographing this and several other similar aircraft, some in Singapore markings back in November 2000, a year after the sheet option. See image below and you can see that it reverted to Singapore insignia. 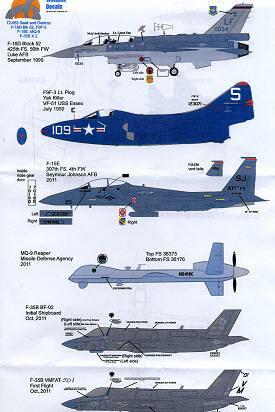 Next is a Korean War Yak killer from VF-51. This F9F-3 was deployed aboard the USS Essex at the time and does not carry any special kill marking. Even unit colors are minimal. Third option is an F-15E from the 307 FS at Seymour-Johnson AFB in 2011. This unit used to fly F-16s, but with the increased drawdown of squadrons, became an associate Reserve unit. The red marked Strike Eagles in the 4th FW used to be the 333FS, the training unit for the F-15E after the demise of the Luke and then S-J 56 FW. Next an MQ-9 Reaper from 2011 of the Missile Defense Agency, hence the civil registration. Finally, a pair of F-35Bs. One was used for initial shipboard trials in October 2011 and is so marked. The second is the initial delivery aircraft for VMFAT-501, also in October 2011.